American manned lunar flyer. Cancelled 1969. The North American design for a Lunar Flying Vehicle would have taken one astronaut and up to 167 kg of cargo to a distance of 3. 2 to 8.5 km from a lunar landing site in minutes, at a maximum speed of 85 m/s. AKA: Lunar Flying Vehicle. Status: Cancelled 1969. Payload: 168 kg (370 lb). Gross mass: 618 kg (1,362 lb). By August 1969 it had been taken up to the level of preliminary design, complete with component drawings and specifications. Although slated for use in an Apollo Lunar Surface Rendezvous and Exploration Phase dual landing missions, these were cancelled, and it was never taken into the hardware stage. The LFV was capable of supporting payloads from 0 to 170 kg. The vehicle, with one astronaut aboard, would be capable of an operating radius of 3.15 km with 170 kg payload; 6.5 km with 45 kg payload; and 8.5 km with just no payload. The vehicle would have a landing gear life of 30 landings and takeoffs; a storage life (dry) of 90 days, and a standby life (loaded) of three days. While the concept would certainly allow quick sorties to locations near a landing site, the mass cost was 136 kg of propellant per sortie. Some of this was to come from residuals in the LM descent stage, but this could not necessarily be planned for. In comparison to the zero propellant cost for a battery-powered rover, the LFV would seem to be an excessive expenditure of precious mass on the lunar surface. Nevertheless the vehicle was the baseline mobility vehicle in several NASA studies and considerable funds were expended making preliminary designs. The North American design would take 17 to 20 months to design and deliver, most of the development effort being devoted to a reliable, throttling storable propellant engine. 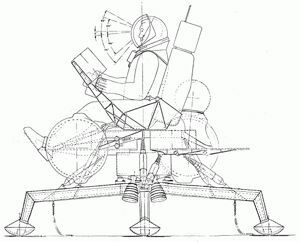 There would be four of these per vehicle, each with the following characteristics: maximum thrust 50 kgf; minimum thrust of 8.3 kgf; delivered specific impulse 291 sec at minimum thrust (steady state); exit/throat area ratio of 40; engine inlet pressure no greater than 15 to 19 bar; reliable operating life of one hour; and capable of using propellants remaining in the lunar module (LM) descent propulsion system (nitrogen tetroxide (NTO) as oxidizer and Aerozine 50 - 50 percent hydrazine, 50 percent unsymmetrical dimethylhydrazine - as fuel). Nominal oxidizer/fuel mass ratio was to be 5 to 1. Helium pressurant and provisions for attachment of an engine thrust measurement device at the gimbal ring was required. Crew Size: 1. Structure: 17 kg (37 lb). Reaction Control System: 45 kg (99 lb). Recovery Equipment: 28 kg (61 lb). Navigation Equipment: 15 kg (33 lb). Electrical Equipment: 12 kg (26 lb). Communications Systems: 12 kg (26 lb). Crew Seats and Provisions: 4.00 kg (8.80 lb). Crew: 172 kg (379 lb). Environmental Control System: 5.00 kg (11.00 lb). RCS Coarse No x Thrust: 4 x 8 to 490 N (throttling). RCS Propellants: 136 kg (299 lb). RCS specific impulse: 291 sec. RCS total impulse: 392 kgf-sec. Family: Lunar Flyers, Moon. Country: USA. Spacecraft: LESA Lunar Base, ALSS Lunar Base. Agency: NASA, North American. Bibliography: 16, 1992, 4445, 4446, 4447, 4448. Opposition to a major effort to develop a lunar flyer until after the Apollo 16 mission - . Nation: USA. Program: Apollo. Flight: Apollo 11, Apollo 16. Spacecraft: LFV North American. The Flight Crew Operations Directorate expressed opposition to a major effort to develop a lunar flyer until after the Apollo 16 mission. 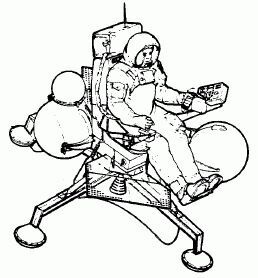 Plans for Apollo flights 12 through 16 required that the LM be maneuvered to landings at various points of scientific interest on the lunar surface, and experience from Apollo 11 and partial gravity simulators indicated the crews would be able to accomplish their surface EVA tasks for these missions without the aid of a mobility device.